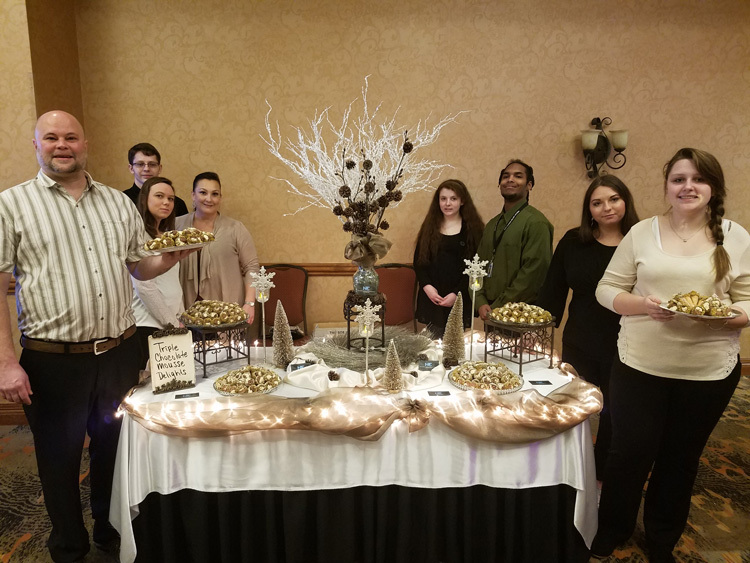 Hot Springs, Arkansas — National Park College’s (NPC) Hospitality and Tourism program won third place for best taste and best presentation at the 15th Annual Chocolate Festival hosted by the Cooperative Christian Ministries and Clinic (CCMC) Sunday. This is the third year in a row the group has won at the festival. They tied for first place in 2017 for people’s choice and won first place last year for best taste. This year students made 800 mini waffle cones dipped in milk chocolate, rolled in crushed pistachios and filled with 2 mousses: orange dark chocolate mousse and white chocolate pistachio mousse. Pictured left to right is Doug Phillips, Jacob Lilley, Deanna Medlock, Breana Zuetlau, Joy Victory, Jarvis Hall, Hailee Willis, and Trinity Taylor.